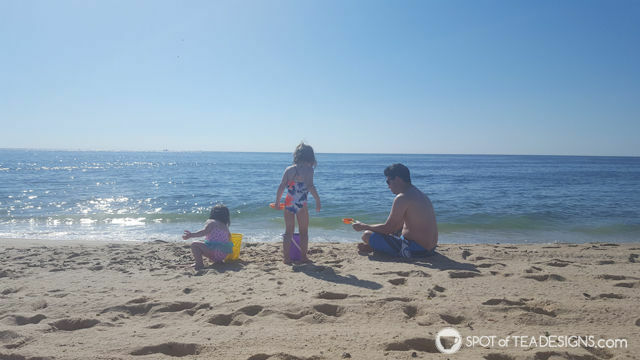 While we are only about 40 minutes from the beach, we hadn’t ventured there much in the last few years since we had a too tiny infant or a toddler who was iffy about sand on their feet. This year they are both loving the beach! We have a beach house booked for August and have made a few trips this summer to get them used to the scene. 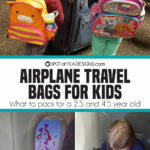 Since I’m all about sharing our experiences, especially packing lists, today I am sharing some toddler mom advice and my beach packing list! I’m sure we all bring the same similar stuff to the beach but it never hurts to peak over someone’s shoulder to see what’s on their beach packing list to make it more fun! This is what we bring for a few hours of entertainment! 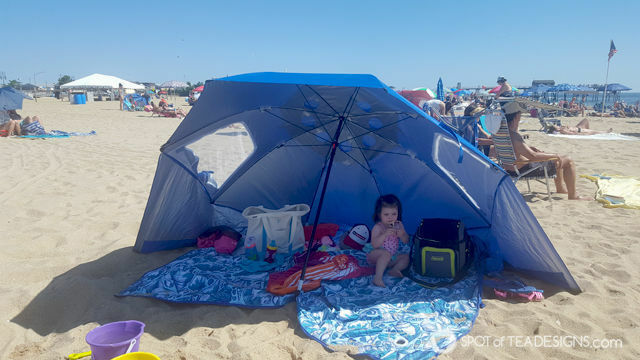 Umbrella/Tent – Kids love tents so the beach is no different. This model can be both a high standing umbrella or it can be staged in a leaned setting to create a half tent. 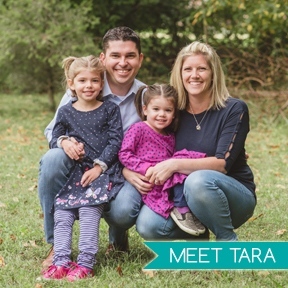 There are two mess windows you can unzip to allow for an extra breeze and it’s big enough to shade our family of four. Fold up waterproof blanket – We got this one at Sam’s club and it’s AWESOME. It’s large, waterproof, has a hold to stick your umbrella in (which is not properly used in the photo above haha), and weighs in the corners so it doesn’t lift in the wind. The whole thing folds and zips into a tote bag that’s attached so there’s not part that can be accidentally left and flying away on a windy beach day. Beach towels – one for each person. We don’t do beach chairs. Sunscreen- Can you believe that we have to have 3 different brands of sunscreen for all the different skin types in our family? 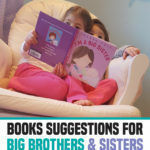 We found that the Neutrogena Sensitive Skin is the best for Hailey’s eczema prone skin. Swim diapers and wipes – Hoping this won’t be on the list next year, but we only throw a few of these in the bag. 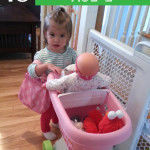 Hailey also wears both a swim diaper and a reusable swim diaper cover over it in case she has a #2 accident. We leave our regular diaper bag and change of clothes in the car for after beach times. The wipes double as hand cleaners for snack time. Baby powder – it helps to get sand off of skin, a great mom hack! Wet bags – We have two of these that we throw their wet swimsuits in so it doesn’t get the rest of our bag wet. 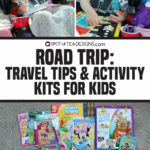 Sand toys in a mesh bag – Kids, of course, need something to do when they’re at the beach so sand toys are where it’s at! 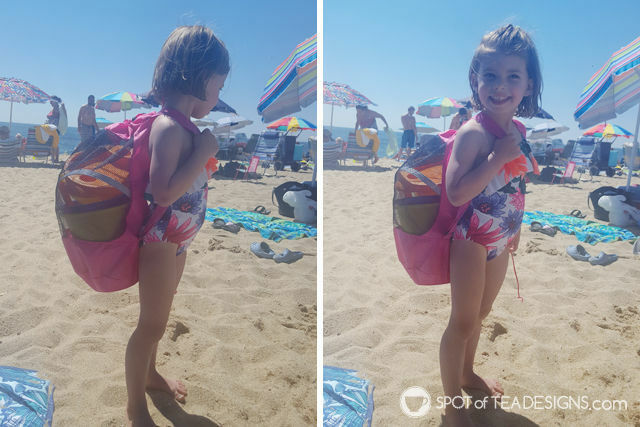 I got this mesh backpack earlier this summer and Brielle LOVES that she can help carry her sand toys from the car to the beach! Water bottles – Each girl has her own Contingo autospout cups that we bring everywhere and we bring an extra water bottle to fill it. I love that they have a fold down spout so it’s not exposed at all times and a handle to carry it. 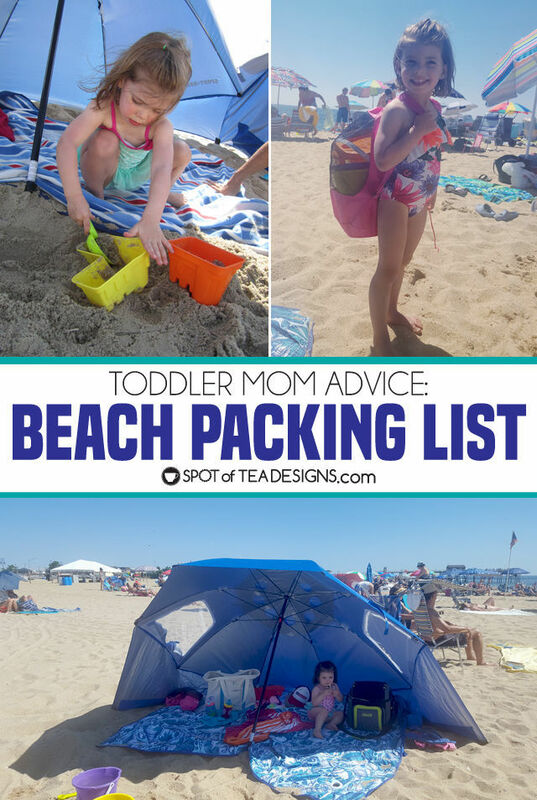 So what have you included in your beach packing list that I need to add?